Pens are poised and journal pages are fresh. Let the writing groups begin! It’s the season of alarm clocks and cafeteria surprises. Lockers and gossip and a few classes in between. I’m revved up for a year of student writing, and happy to expand activities to the young set, students in 3rd, 4th and 5th grade. The Waldport Community Learning Center, Seashore Family Literacy and I have teamed up to offer three great writing groups and I’m looking for eager kids and adult volunteers. No writing experience necessary. Just a love of reading, writing, and the magic that happens when you put pen to page. Literacy gets fun in this hour of structured reading & writing games, one-on-one reading, library visits, and storybook tales. This group is offered through the 21st Century After-School Program. Parents may register students when completing school registration forms, or by calling Melaia Kilduff, Center coordinator, 563-3476. A fun and engaging way for students to explore creative writing through writing games, walking field trips, word-art crafts, poetry and prose. This group is offered through the 21st Century After-School Program. Parents may register students when completing school registration forms, or by calling Melaia Kilduff, Center coordinator, 563-3476. 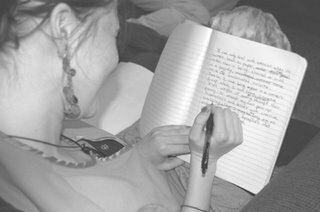 Students generate fresh poetry and prose during this free, weekly dose of revved-up writing practice. In this supportive setting, young writers share their work with the group, and enjoy feedback from adult mentors. This group is offered by Seashore Family Literacy. Students may register by calling Drew Myron, instructor, 547-3757. Class is limited to 12 students.